Where is the best place to live in the UK? The answer is simple. It's in my street. But that's just my view. Ask someone else and you'll get a different answer. Of course, this kind of thing doesn't really work when you do it from the perspective of individuals, and definitely not when you're trying to do it for the whole country, as I recently did for Outline Productions in their Channel 4 documentary, presented by Sarah Beeny. 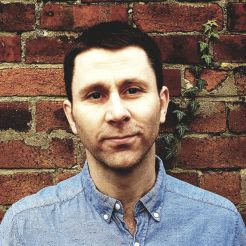 This blog post gives a little bit of the back story to it, discusses how mortified I am to be on the telly and a bit about the numbers. But how do we decide which is the best place to live in the UK? The real answer is that it depends upon who you ask and how you measure it. 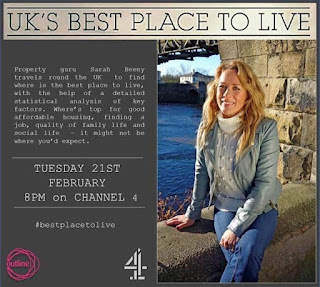 The background to this project is that I was contacted by Rachel Eadie of Outline Productions to see whether I could help them develop a 'best places' index based on a number of different criteria, such as income, house prices, wellbeing and so on. This was late in 2016 and I was a bit pushed for time, but it sounded interesting and I know the data pretty well so I said yes. After a few days of work and tweaking things I arrived at a final result. I received an initial 'wish list' of things to include from Outline Productions and I stuck to that where I could. The only criteria that I added was that I wanted this to cover the whole UK at local authority level - 391 in all - so that it could make some kind of sense across the entire UK. Too often these things only cover one or two parts of the UK. I included data on income, housing affordability, life satisfaction, happiness, jobs, unemployment, health, child poverty, and people aged between 20 and 29. The last bit highlights an important fact. We wanted this to be about the 'best place' to live for people in that age category. In this sense, think of it as a 'best place you might actually be able to move to and afford to rent or buy in' index. I say this because many existing 'best place to live' indices end up being topped by areas with an average house price of £500,000, and that's no use for most people. Also, given the propensity of people in our target age group to locate in larger cities, I also computed a 'proximity index' in relation to how close each local authority is to 13 major cities in the UK. Some places, such as Orkney, do really well on quality of life or 'best place' indices but their relatively low number of jobs and distance from major population centres means moving there is not a viable proposition many will consider - even if they are great places to live. I never thought doing television would be easy but by doing this little bit of work for a television production has made me realise a) how much goes into a single hour of television - so much work! and b) how bad I am at speaking, walking, thinking and communicating on camera. Seriously, I am not the most articulate person but I'm not completely terrible either. At least I didn't think I was. What I found is that having a camera on me made me robotic, incoherent and a lot more nervous than I expected. Things I know off by heart about data and places suddenly became impossible to recall when the camera was rolling. I also kind of forgot how to walk properly when being filmed, but I trust that the expert skill of the producer (Laura Mansfield of Outline Productions) means that I didn't end up totally ruining their programme. More seriously, it was an interesting experience and one that I think is useful. We filmed my bits in one day in Sheffield in December 2016, in ICOSS and across the way, outside The Diamond. I saw the final edit of the programme in January and despite not liking the look or sound of myself I thought the programme was well done. They sneakily got some good stuff in there about jobs-housing balance and the fact that indices are inherently subjective. I'm posting this just after the initial broadcast has finished in the UK (8pm, Tuesday 21 February 2017) so I can say a bit more about the final results now. It had been under embargo until that time. 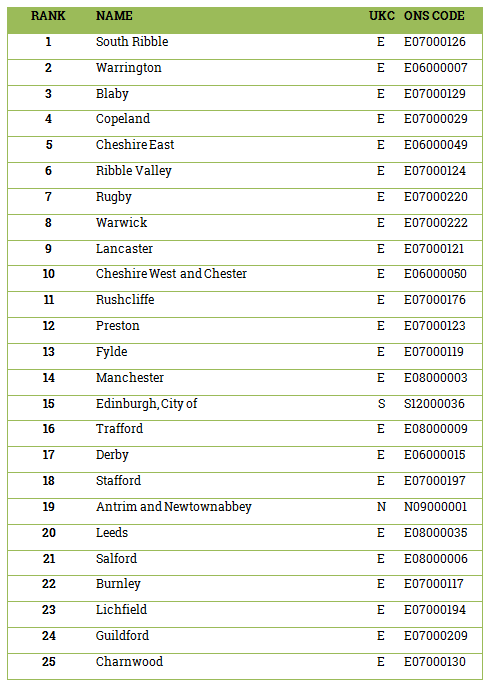 Remember that the areas I ranked relate to local authorities (e.g. 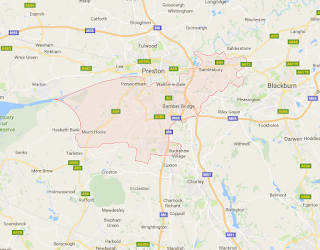 London Boroughs, urban local authorities such as Leeds, Bristol and Newcastle, Glasgow, Cardiff, Belfast and so on). Individual places within local authorities, or places that go beyond the boundaries of individual local authorities are not part of the story here. 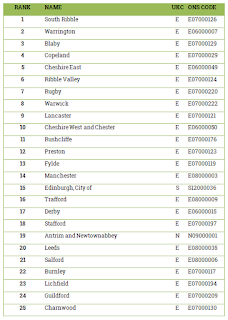 It's based on the current 391 local authorities of the UK. South Ribble came top as our 'best place to live'. You may not have heard of it! 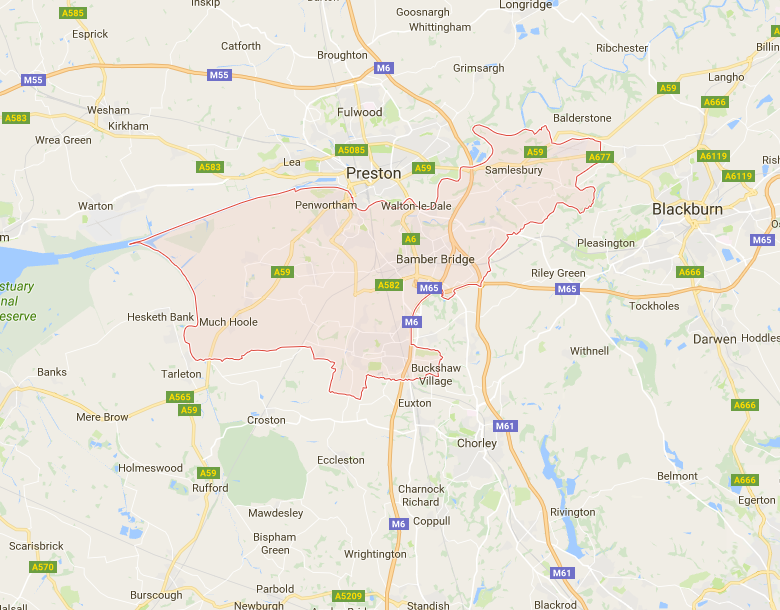 But it's just to the south of Preston and includes within its borders places like Penwortham, Leyland and Bamber Bridge. To add a bit of socio-economic data to this picture, you can look at the one of the maps from my Indices of Deprivation atlas (all other local authorities in England are here). In the map below, blue areas are among the least deprived in England, and the red and orange areas amongst the most deprived. 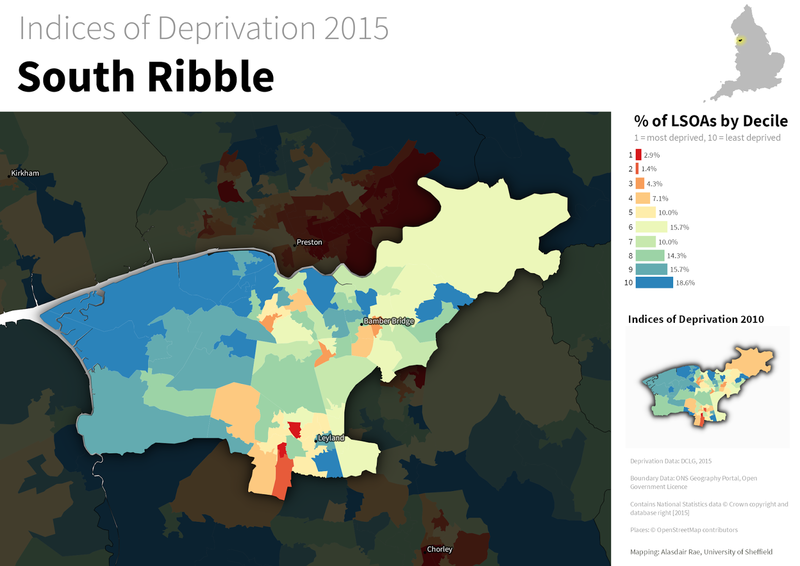 You can see that for South Ribble most areas are in the least deprived deciles. Bear in mind that this all depends upon how you measure things - which of course also applies to just about anything in socio-economic studies. But, having said that, my follow up discussions with people who actually live there gave some more weight to the findings and there does seem to be a real dynamism in the area, possibly also because it is included in the new City Deal in Lancashire. I always try to 'sense check' the results of any data analysis against personal experiences of people who know areas, just to get an idea of whether the data seem to be telling the truth, as it were. For more on what's happening in South Ribble, see this piece in the Lancashire Evening Post. Remember also that part of the reason South Ribble came out top is because of what's nearby - and this is important to people when it comes to transport and jobs. 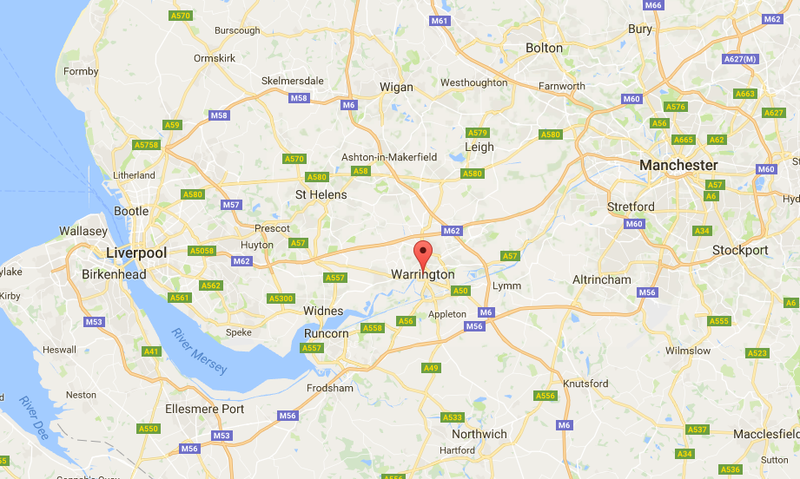 Next on the list was Warrington, located in between the urban local authorities of Liverpool and Manchester in the North West of England. This is a very good example of how transport connections, proximity to major urban labour markets and relatively affordable house prices combine to make it the kind of place that people could realistically move to and live in at the life stage which was the focus of the programme. Again, from personal experience I know that many people choose to live there for the reasons outlined above, so I wasn't very surprised by it. The North West of England dominated the top ten, but Blaby snuck in to the top 3. Blaby is another one of those places that is not on people's mental maps because it's the name of a local authority area rather than a well known town or city. 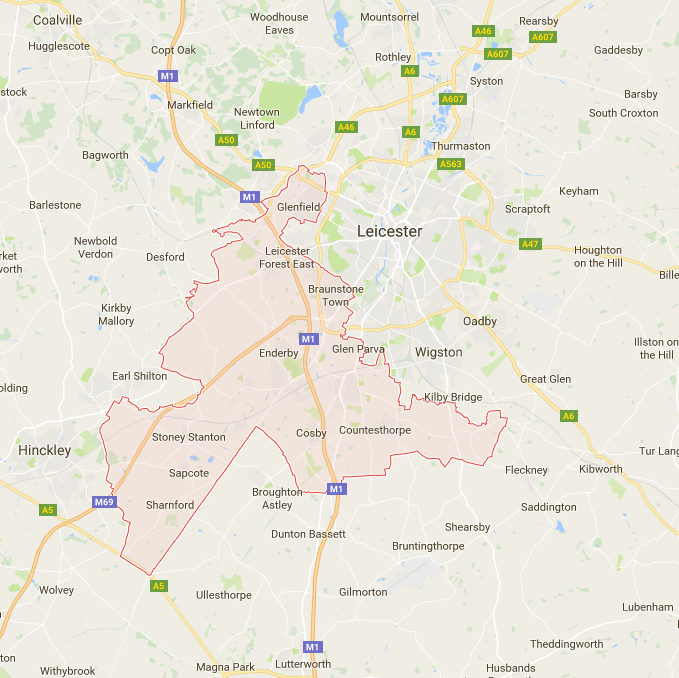 However, it's a suburban local authority to the South West of Leicester in the East Midlands, as you can see below. 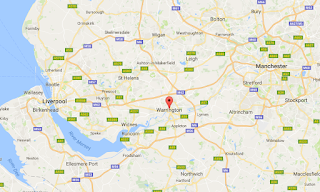 You can see that, like South Ribble and Warrington, it is also very well connected in relation to transport (e.g. 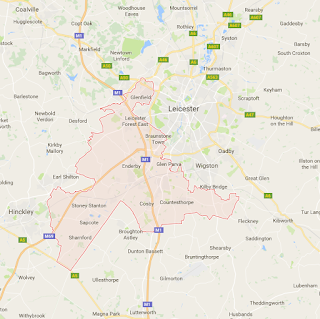 the M1) but this area also abuts a major English city - Leicester. This was a feature of several local authorities that came towards the top of the rankings. 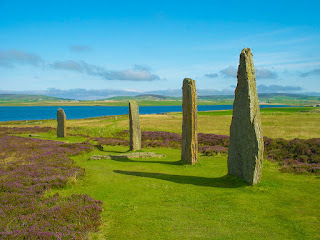 Other places like it include Rugby (at number 7) as you can see below. Here's a basic map of the rest of the top 10 - just to give you an idea of the distribution of places. As you can see, 7 out of the 10 are in the North West of England - this is driven partly by relative affordability but also by things like happiness and wellbeing, and connectivity. Below this, you'll see a list of the top 25 places on the index. Anyway, that's a little bit more information than is in the TV show itself so hopefully some people will find this informative. The precise position of places on the list does, as I explained before, depend upon how you choose to weight and measure individual indicators but this is how things came out. If we repeat it - e.g. in Best Places 2020 - we might find that different places come out top. The fact is that anywhere in the UK could be someone's own 'best place to live' with the exception, I suppose, of prison! Our programme gives the 'best place' notion a slightly different take on things. Notes: in the bits when I discuss the data, there are a few times when I've described it in ways that may seem unconventional - or even wrong. One such example is in relation to disposable income when in fact what I'm really discussing is discretionary income. I wanted to try to be informative without being too technical but at times I may have gone a little too far and simplified things more than was necessary. Having said that, I realise that the kind of people I hang around with might know these terms but the average TV viewer probably doesn't know or care. I mention it here in case anyone spotted this or any of the other things that seem a bit odd. After all, this is part statistical exercise and part entertainment. And why am I getting involved in this stuff anyway? Well, I like to do interesting work beyond the confines of the academic world and this seemed like an interesting opportunity to offer a different take on 'best places'.